Internet Protocol television (IPTV), Over-the-top (OTT), Over-the-air (OTA), Skinny Basic, Pick-And-Pay, Online-Only, Pick-Packs, Simultaneous Substitution, Canadian Content, Class A, Class B, Mandatory Carriage, Broadcast Distribution Undertaking (BDU), Vertically Integration (VI) Linear television, Content Regulation, Netflix, Google, CRTC, TV Everywhere (TVE), US 4+1, Pay-per-view (PPV), Video on demand (VOD), Described Video (DV), Cutting the cord. What does it all really mean for you? As someone who has spent the past two years immersed in launching beanfield TV, I followed the CRTC “Let’s Talk TV” hearings (and watched CPAC) more than I ever would have imagined. The CRTC started the conversation in 2013 as a part of a comprehensive review on how Canadians watch and pay for television. This culminated in two weeks of public hearings with different stakeholders. Most of the hearings were dull and uneventful but some were truly riveting…specifically the Netflix presentation (or maybe I’m just weird). The link for the Netflix presentation follows, in case you want to catch up on some of the more interesting moments. http://youtu.be/bQSGmO8RShw. The hearings confirmed in part what we already know: consumers feel they pay too much for TV, and they don’t like to pay for channels they don’t watch. CRTC regulations and the content owners’ requirements have created the current environment and unraveling it will be a difficult process. When we decided to launch a TV service, we wanted to do what we always do – keep services simple and focus on what customers want. We planned to offer customers a “super small” basic TV package (what the CRTC is now calling “Skinny” Basic) and allow users to choose only the channels they wanted. We weren’t going to force subscribers to pay for channels they didn’t want. I spent many a late night tweaking and adjusting packages to be compliant with both the CRTC and the content owners. We couldn’t offer a Skinny Basic package because we needed to know what we would pay for the content (the cost for certain content could vary by up to 500% depending on the penetration level). I decided to add a lot of the popular channels to our Basic package, while trying to keep Theme packs small – so customers wouldn’t feel they were paying for channels they didn’t want. We also had to launch without a few key channels simply because we couldn’t meet the content providers’ requirements for penetration and packaging. I considered including some “à la carte” channels for the TV service launch, but the proposition was too complex and would undoubtedly require multiple changes post-launch, so it was delayed until phase two. Now, ten months after the launch of beanfield TV, we are in a much better position to offer customers the channels and packaging originally envisioned. We’re pleased to announce we’ve made some changes (effective Nov. 10th), highlighted below. A new “Premium Basic” package. This package allows us to offer channels we couldn’t previously due to some content providers’ requirements. Popular channels from Theme packs have been moved to Premium Basic to meet minimum penetration level requirements from content providers, and also offered à la carte when possible. Less theme packs and more channels in some packs. A price reduction on Theme packs (yes, that’s right, the price is reduced!). New à la carte channels starting from $2 per channel. We’ve done our best to offer customers appealing packages without increasing their monthly costs. 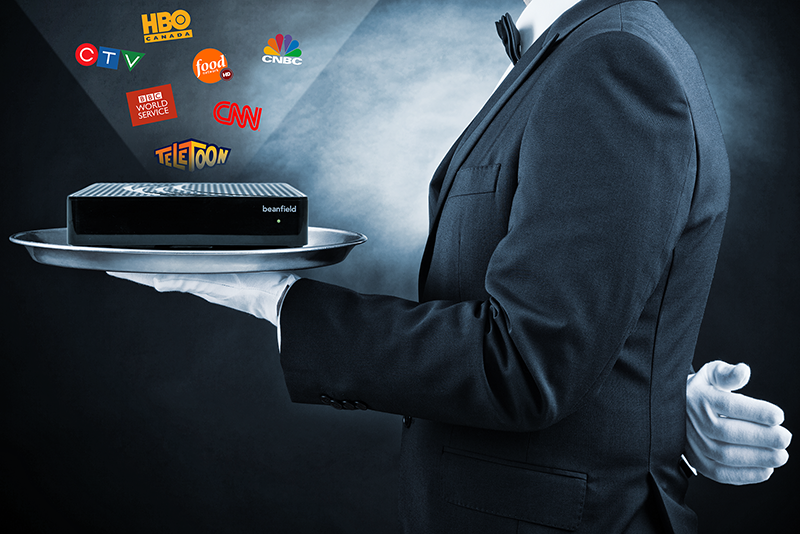 We’ll continue to add à la carte channels whenever possible to give customers more choice. We’re hoping these will be the final changes to our channel line-up until the CRTC releases their new regulations, which is imminent. The CRTC’s goal is to lower consumer costs while increasing consumer choice. Skinny Basic is coming. So is more à la carte channels. How TV is delivered is definitely going to change but it’s not going to be easy. US content owners have warned that if they are not conceded penetration and package requirements, they will pull out of Canada and offer service via OTT or online only. Canadian content owners have warned the proposed changes will reduce the number of specialty channels, and result in lost jobs. Will these changes lead to lower prices for consumers? I don’t think so. I believe consumers will pay what they are paying now, and only have access to the select content they want. We will also see a reduction in the number of specialty channels. We’ll see more OTT providers like Netflix, where consumers can watch what they want, when they want. We will see more content providers offering their content directly to the consumer and they will be able to subscribe directly (via an App or online). Consumers are going to need faster Internet connections with unlimited data to take advantage of this changing landscape (exactly what we offer). Although it sounds all doom and gloom for the old school television services, it isn’t. There will always be a place for linear television (sports events, news and live events). People will always want to turn off their brain and channel surf. There is something about flipping through your guide repeatedly and complaining “there is nothing to watch on TV”. At least, that’s the way I see it. Great info and insight! Good for you! The traditional cable ‘owners’ here in Canada have created a unsustainable model and now are using outdated regulations to try and sustain that model. The CRTC’s recent decision regarding SimSub and the Superbowl is a perfect example of this. Ad revenue is down because people are watching less live TV. Sports and News are the exceptions, but even Rogers has learned that live sports (hockey) does’t get the audience it once did. The traditional cable giants saying that specialty channels will be hurt if Canada moves to a ‘a la carte’ model has truth, but not many Canadians care. Specialty channels have been handed out like candy and largely undeveloped by the content owners. With minimal original programming that is simply put on repeat. It’s a free market and as such if those channels can’t survive outside the current forced bundles they are in, then why should we as consumers care if they die? It’s also worth noting that the media giants here in Canada have done very little to actually develop an audience for these specialty channels. If they offer them only through one outdated platform (cable TV) when clearly the consumer is looking to be able to access content in every way possible. None of the media giants have done much in the OTT platform (Apple TV, Roku etc.) and they certainly don’t make any effort to make their content available online through desktop, tablet or even paid services like iTunes or Amazon. Even Netflix Canada is missing large chunks of Canadian content. Instead Canadian cable companies have become simple middle men who think that the internet should have the same borders that exist on a traditional paper map. The truth is that it’s set our digital growth back. Paying millions of dollars for the ‘Canadian rights’ to US content that Canadians can and will access via other platforms like OTA signals, internet platforms like Netflix, Hulu YouTube and Amazon. All Canadian consumers are doing now with traditional cable is overpaying for the middle man and they are sick of it. Besides CBC, there is no need for Canadian TV networks in this day and age. They all have their own news specialty channels, everything else they broadcast is produced by other markets. They simply mark up the prices. The music industry learned this the hard way, and now it’s time for the cable industry to take it’s turn. Content is king, and Canadian cable providers know they not big players in the content world. They are just small players in the ‘rights’ world. Even their recent venture into the streaming world proves that they are well aware that their time has come. While they are tied to traditional platforms, other innovators are moving to a direct to consumer model, HBO Go, Netflix, Hulu, CBS All Access, SlingTV. It’s a new world and cable providers who don’t innovate will be left behind.